SAN FRANCISCO, June 17, 2015 /PRNewswire/ — First Republic Bank (NYSE: FRC), a leading private bank and wealth management company, and Constellation Wealth Advisors, one of the nation’s foremost independent wealth advisors, today announced that First Republic Investment Management, Inc., a wholly-owned subsidiary of the Bank, will purchase Constellation Wealth Advisors for approximately $115 million, subject to the satisfaction of certain closing conditions. Constellation Wealth Advisors provides high net worth individuals, families, and family foundations with strategic investment advice and asset allocation, including alternative investments. As of March 31, 2015, Constellation Wealth Advisors had wealth management assets of $6.1 billion. The six partners of the firm have signed long-term employment contracts as part of the transaction, which is expected to close in the third quarter of 2015, subject to the satisfaction of customary closing conditions. The purchase will include substantially all of the assets of Constellation Wealth Advisors. First Republic expects the transaction to be modestly accretive to earnings in 2015. The firm, which has offices in New York City and Menlo Park, operates in regions where First Republic has a strong presence. 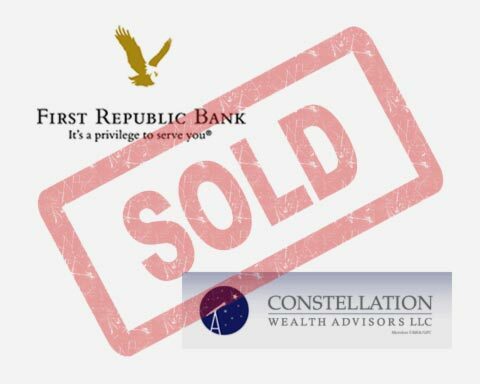 Constellation Wealth Advisors, LLC was established in 2007 as an independent multi-family investment office with an uncompromising commitment to the best interests of its clients. With offices in New York and Menlo Park, California, the firm is committed to long term relationships with client families to help them reach and maintain their life goals and to simplify the inevitable complexities that come with wealth. Prior to forming the company, the managing partners of Constellation Wealth Advisors had built two of the largest wealth management practice groups at Citigroup’s Family Office Division. Since its founding, the firm has enjoyed consistent growth in assets under advisement and has regularly received recognition by the industry, most recently receiving the award for Best Performing Private Wealth Manager over $5 billion by the Private Asset Management Awards for 2015. Free Agency, that indefatigable force of Capitalism! Why don’t you go Sign Yourself!